Where to find Scranton hotels near an airport? Where can I find hotels in Scranton that are near tourist attractions? Short- and long-stay accommodation options are in abundance in Scranton. Approximately 25 places to stay can be found within a 0.1-kilometre (0.06-mile) radius of Scranton's downtown. One of the ingredients to hassle-free traveling is finding a convenient location to base yourself, so have a look at the Hilton Scranton & Conference Center and Radisson Lackawanna Station Hotel Scranton, which are located a short distance of Scranton's heart. 10 kilometres (6 miles) from the center of Scranton is the accommodation area of Clarks Summit. This boasts 6 establishments. In Clarks Summit, the Hampton Inn Clarks Summit and Nichols Village Hotel are among the options. Moosic another Scranton hotel neighborhood is 6 kilometres (4 miles) from downtown Scranton. Some of the better known Moosic accommodations include the Courtyard by Marriott Scranton Wilkes-Barre and Hampton Inn Scranton at Montage Mountain. You can also find a hotel establishment in Wilkes-Barre, which is home to the Fairfield Inn & Suites Wilkes-Barre Scranton and The Woodlands Inn, an Ascend Hotel Collection Member, and Tunkhannock, which has the Comfort Inn & Suites Tunkhannock and Hampton Inn Tunkhannock. Dunmore is 5 kilometres (3 miles) from Scranton's downtown, while Pittston is 15 kilometres (9 miles) from the main part of Scranton. The Sleep Inn & Suites Scranton Dunmore and Quality Inn Dunmore are situated in Dunmore, while Comfort Inn Pittston - Wilkes-Barre/Scranton Airport and Super 8 Pittston are located in Pittston. The Scranton area has some lower-priced accommodation options that will satisfy even the most budget-minded visitors. The Shadowbrook Resort is 25 kilometres (16 miles) from the heart of Scranton, while the Quality Inn Dunmore is 5 kilometres (3 miles) away. 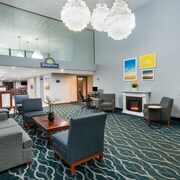 Other Scranton hotels in the lower price range include the Four Points by Sheraton Scranton and the Microtel Inn & Suites by Wyndham Dickson City/Scranton. 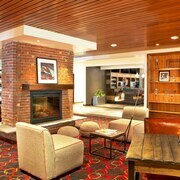 The Residence Inn by Marriott Scranton is situated 5 kilometres (3 miles) from the central part of Scranton. 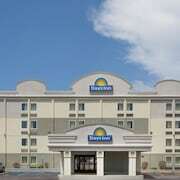 Alternatively, the Holiday Inn Express Hotel and Suites Scranton is situated 7 kilometres (4 miles) away. Another possibility is to make a booking at the TownePlace Suites by Marriott Scranton or the Holiday Inn Express Wilkes Barre East. For those keen to see some more of the forests, mountains and rolling hills common in this part of the world, you might also plan some extra days in other destinations in Northeastern Pennsylvania. No matter if you engage in common local activities, such as snowboarding, skiing and cross-country skiing, or simply travel around to see the attractions, you will be able to book suitable accommodation in the region. 75 kilometres (47 miles) away from Scranton you'll find Towanda, where you can enjoy Towanda Country Club and Stephen Foster Memorial. Should you wish to stay in Towanda, be sure to check out the Paradise Inn & Suites and Fairfield Inn & Suites Towanda Wysox. 40 kilometres (26 miles) to the southeast of Scranton, you can also stay at Mount Pocono, which is home to the Mount Airy Casino and Resort and The Inn at Pocono Manor. The Mount Airy Casino and Summit Lanes are a couple of the most popular sites to check out should you visit Mount Pocono. If you are traveling by air to Scranton, the most convenient airport is Scranton International Airport. The nearest accommodation is Rodeway Inn Moosic - Scranton. What are the most popular Scranton hotels? Are there hotels in other cities near Scranton? What other types of accommodations are available in Scranton? Explore Scranton with Expedia.ca’s Travel Guides to find the best flights, cars, holiday packages and more!